Frederique Constant and Alpina are scheduled to introduce over 10 different Horological Smartwatch models during 2015. Luxury watch styles will be available for both ladies and gentlemen. MMT (Manufacture Modules Technologies Sàrl) is a new Swiss joint venture that was created by Fullpower Technologies, Inc. of Silicon Valley plus the owners of the Frederique Constant Group. The MMT mission is to introduce the exciting MotionX-365® Horological Smartwatch Open Platform to the powerful Swiss watch industry. 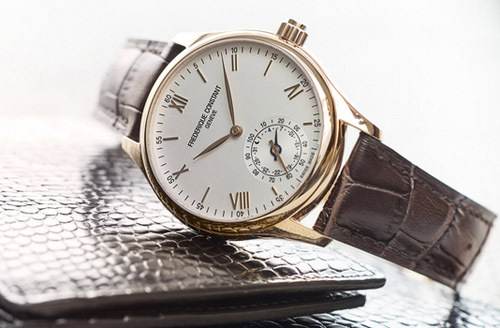 Initially, the MMT partners consist of Frederique Constant who is the Geneva based luxury watch manufacturer of classical watches. Also joining the partnership is Alpina, who is popular Swiss sports watch manufacturer that was first founded way back in 1883. The new Swiss Horological Smartwatch collection is powered by MotionX® which allows bi-directional communication with both iPhone and Android apps. As a result, the Swiss Horological Smartwatch synchronizes automatically with applications on Apple and Android smartphones. The Swiss Horological Smartwatch now combines the features and functionality of the MotionX® technology platform with a luxury timepiece. The MotionX patented sensor-fusion engine tracks activity and specific sleep patterns with exceptionally high accuracy. Activity and sleep information is presented in real-time on the Swiss Horological Smartwatch using beautiful traditional analog dials. There isn’t a digital screen, but the gorgeous, laser cut hands on the watch dial display information in analog form. The end result is very important here as studies have shown that better sleep and a more active lifestyle produce effective, positive behavioral changes. The basis of the new Swiss Horological Smartwatches is based on tracking and analyzing more than 100 million nights of sleep, and years of research and development on the biomechanics of natural human motion. Frederique Constant is well respected as a family owned watch manufacturer, headquartered in Plan-les-Ouates, Geneva, Switzerland. The luxury watch company develops, manufactures and assembles in-house calibers, in 18 different versions since they began in 2004. If you are watch connoisseur and interested in purchasing a new Swiss Horological Smartwatch, contact us today. Follow our popular luxury blog to read about the latest luxury watch news and product releases.